How do I know if my order has been received and/or being processed? We are using iPay88 as our payment gateway. By making payment through our online payment system, an acknowledgement email from iPay88 will take place and has been successfully received. You can call / WhatsApp / email us to know status of order processing and we’ll get back right to you. By paying through direct-bank in, please do ensure you email / WhatsApp us a copy of your deposit slip and we’ll then verify it with the bank and get your order processed. Nevertheless, although extensive care is taken in processing all online orders, there are still some possibilities beyond our control whereby an order could be overlooked. Therefore, we always suggest our urgent customers to make their orders by phone to avoid any form of inconvenience. Call us at 017-2122166 and speak to us. What if connection to internet is abruptly halted mid-way? Payment by credit card (online) orders will not be processed if connection is abruptly halted. Nevertheless, you can give us a call to check on it. What if no one is answering my call? Please remain calm as we might be on another call. We will call you right back again. What if I want to cancel a purchase? To be fair to us, we are unable to cancel or change orders already in process, en route, or delivered. Same-day orders are processed immediately, and cannot be changed. If, at any time, you experience problems with an order, please call us at (+6)017-2122166. Why is that I did not receive the same as seen on website photo? Occasionally, floral and packaging materials substitutions are necessary due to availability issues. Happy Moments reserves the right to substitute any floral and packaging materials of equal or higher value while preserving the style, theme and colour scheme of your order. For American Express, MasterCard and Visa, we are powered by ipay88. This is a totally safe payment gateway used by many merchants. Your credit card statement will indicate ipay88 as the merchant. How secure is "IPay88" payment gateway? Very secure. 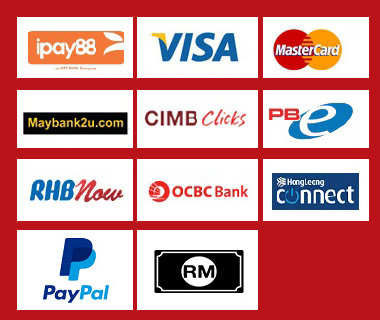 Ipay88 is regulated under Malaysia's Payment System Act and also PCI Data Security Standard (DSS) compliance and is a leading regional Payment Gateway Provider in South East Asia. After ordering to our bank account for the amount due, please do be informed to either email / WhatsApp us a copy of the receipt together and we will process your order upon confirmation. Where do you deliver ? Is the price inclusive of delivery charges? It is FREE Delivery to most area in Johor Bahru and island-wide in Penang. Refer to our Payment & Delivery page for details. Are you doing delivery outside of Johor Bahru and Penang ? YES. We perform delivery to other towns in Johor such as Batu Pahat, Muar, Ayer Hitam, Kluang, Segamat via our Partner Florist. Also to areas within the Klang Valley. Unfortunately, we do not delivery to Singapore at the current moment. Our delivery time starts at 9AM and ends at 6PM , Mondays to Saturdays. Do you deliver during Peak Season? What if no one’s home? For delivery to house, we will deliver to recipient family member. For delivery to office, we will deliver to receptionist or recipient colleague. May I know your refund policy? There will be NO REFUND for all finished products/orders. Any problems or complaints upon receipt of bouquets must be made within 24 hours via phone (017-2122166) or WhatsApp.